After checking out of our Sint Maarten hotel, Sam and I headed to one of the most famous beaches in the world. Not for its pristine sands, or crystal clear waters, but for its amazing view of landing airplanes! 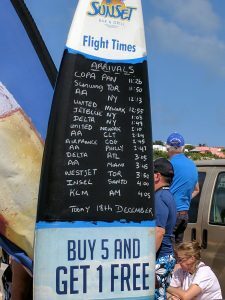 We weren’t the only tourist that descended on Maho beach that day. It was funny watching the spectacle of gawkers, eyes in the sky, trying to spot out airplanes in between waves from the ocean. Every now and then you’d hear yelps as a wave would wash away someones belongings. I was happy that I was able to snap this great video of a JetBlue flight from New York landing at SXM. 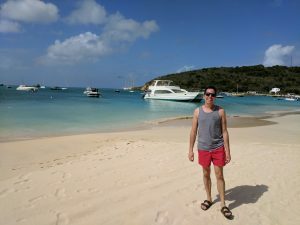 Grabbing our (dry) stuff from the beach and hopping into a cab, we made our way to the ferry terminal to head north to Anguilla. 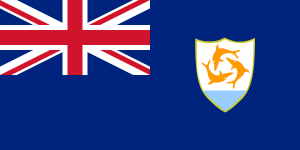 The 20 minute shuttle from the Dutch Side of Sint Maarten to Anguilla was rough and choppy, not uncharacteristic for this time of year. Leaving The Netherlands and arriving in the UK meant that I had to go through immigration and passport control. Arriving at the Four Seasons, I was blown away at the property. This place was amazing. I would never be able to afford to stay at a resort like this, so I felt extremely lucky to be able to experience how the wealthy relax. Sam and I walked down the beach to Blanchards Beach Shack. Our dinner plans on the beach plans were foiled, because we didn’t realize that the shack was closed on Sundays! That didn’t stop us from enjoying the ocean, however. 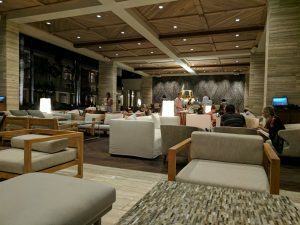 In the end we had dinner at The Sunset Lounge, which was designed to offer spectacular views of the sunset while enjoying Asian inspired small plates. I ordered the Bicol Express bowl which consisted of: Pot Roast Pork, Ginger Infused Coconut Milk Local Seasoned Pepper, Spinach, Leeks, and Cherry Tomatoes. Dinner did not disappoint and neither will day two on this amazing island. Waiting for our boat to Sandy Island. Our destination for day two on Anguilla.